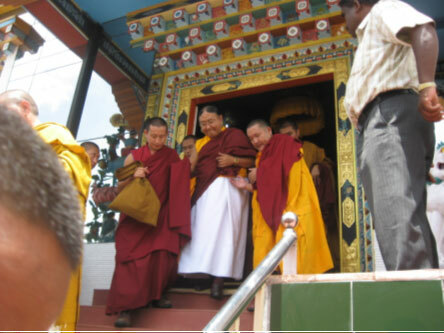 HH Sakya Dagtri Rinpoche visited Namdroling Monastery on 12th August 2009. He was offered mandala by the sangha community of the monastery and bestowed spiritual advice to all the monks and nuns. Here we see him after he received blessings from the holy body (kudung) of the late HH Penor Rinpoche. 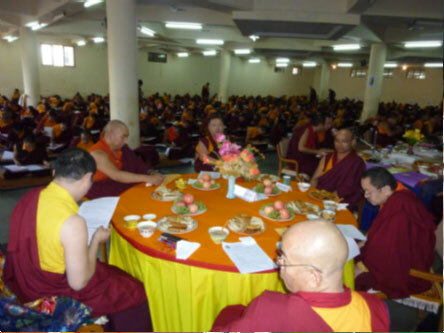 HE Gyangkhang Rinpoche, our three senior khenpos and the teachers of the institute oversee the annual exam of Ngagyur Nyingma Institute, below. The annual exams of the institute, junior school and Nunnery began on 27 Nov 2009 and last until 29 Jan 2010. 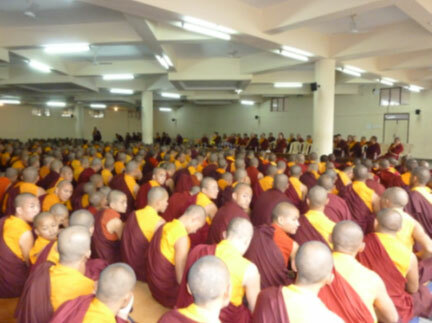 After completing the exam, tulkus and Khenpos gave their advice to all the monks and nuns who will attend the Nyingma Monlam in Bodh Gaya as well as those who will leave for their homes for holiday. 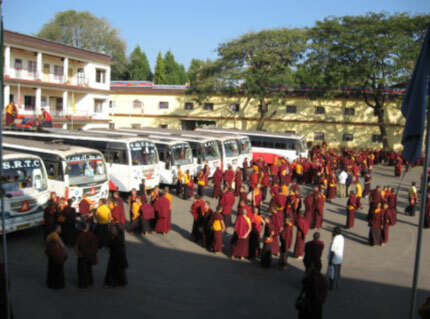 This year more than 2100 monks and nuns are going to Bodh Gaya to attend the Nyingma Monlam Chenmo International World Peace Ceremony which takes place from 16 to 25 Jan 2010. If you would like to know more about these prayers, please visit nyingma-monlam.org. You can follow the Namdroling monks by subscribing to our Twitter.